STRESS - It can be damaging to both our mind and body. We all know stress can affect us in many ways, but our skin usually isn't the first thing we think about when we consider the effects of a stressful lifestyle. We'll be the first to admit that stress can get the best of us sometimes. Having to balance commitments, a career, a healthy lifestyle, and social life takes a serious toll on the skin. Our skin is largely a reflection of our health and how we take care of ourselves — after all the skin is our body’s largest organ. But, sometimes, no matter how much we try taking care of it, factors beyond our control can get in the way. What you need to know about what stress can do to your skin. The unfortunate truth is that stress can affect our skin in many ways, and stress-induced symptoms manifest themselves differently in everyone. As our body responds to stress we overproduce the hormone cortisol — a stress hormone with responsible for the inflammation in our bodies. This inflammation can cause symptoms ranging from an increase in acne breakouts, dryness, irritation and over time even signs of ageing. Stress can also cause flare-ups, worsening pre-existing skin conditions, but it can also just make your skin super sensitive. Taking back control of stressed-out skin. The obvious solution — just de-stress and have great skin, right? For most this is easier said than done, and with the endless amount of things going on in our life, sometimes, being stress-free can seem impossible. So here are a few tips and tricks to help reduce the effects of stress on your skin. 1. Take the time to relax. Sometimes, you just need a break. Make time for yourself and do the things you love. Read. Travel. Try something new. In today's fast-paced world today we tend to forget about taking time for ourselves. Even if you only have ten minutes do something you truly enjoy -because you deserve it. 2. Make positive lifestyle changes. The skin is a reflection of a person’s health and, as such, it's important to maintain a healthy lifestyle. This can include things like getting regular exercise, eating a healthy diet, staying hydrated, and getting enough sleep. By following a healthy lifestyle, you allow yourself not only to look better but feel your best. Allow yourself some time to unwind and treat your skin with a skin care routine that’s simple and effective. 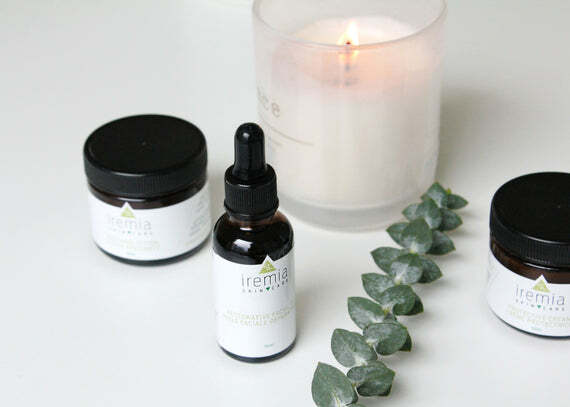 Opting for an all natural line, like Iremia Skincare, that provides a luxurious and calming line. Our mindset is "less is more", so you can be sure that our Restorative Facial Oil, Soothing Lotion and Protective Cream will soothe, calm and strengthen your skin. Overall, when stressed you are less likely to take good care of yourself, and ultimately your skin-care routine will suffer. So make time to fit some of these tips into your daily regimen and your skin and well-being will thank you for it. Because life can be stressful enough.